Single-Serve coffee makers can start your day with almost zero efforts in making coffee. With time and advancement, they have gained tremendous popularity as they are easy to operate, make little or no mess and consistently give good results. These can be easily found in many homes, offices and even restaurants. A lot of valuable time can be saved using single-cup coffeemakers over other types and also they are not heavy on pockets. Single Serve coffee makers are designed to save your valuable counter space with their smaller footprints. They consume less electricity as their programming is made to brew single cups rather than 4, 8 or 12 cups. Many of the single serve brewer’s use capsules as their input material that are prepackaged coffee containers available in wide variety of flavors and strengths providing plenty of options to choose from. Nespresso and Keurig are two leading brands in pod brewing. The difference between those brands exactly resembles the difference between coffee and espresso. Keurig makes regular coffee whereas Nespresso makes espresso. Single cup machines are very favorable for those who mostly prepare one cup of coffee at a time or are living alone. These are also now days called as Busy Man’s Coffee Machine as these tend to serve coffee quickly without much efforts. Note: We will be using terms Single Serve, Single-Cup and One cup interchangeably as they all in actual means the same thing. Without wasting much of your precious time, we are introducing the best selection of single cup machines for you that has been thoroughly researched. A short review about each is also provided that will help you understand each of the below unit better and hence you can then make your final decision. Keurig really got the ball rolling on single-serve coffee with its convenient pod system. The K55 is one of the best single serve and is the easiest to make yourself a coffee mug. After the discontinuation of its viral model K45, the company introduced K55 which came with improvements along with a price drop. K55 a very easy machine to use, particularly when you’re still feeling groggy in the morning! You just simply have to press the power button and choose the 6, 8, or 10-ounce brew button. It takes the machine about 4 minutes to heat up, and after that, you can brew a coffee in just one minute. The main advantage of Keurig system is that one can keep a wide variety of flavors, roasts and other options around even if the machine is used occasionally. The K55 is also great for making tea and hot chocolate. If one prefers to use his own ground coffee, he simply has to purchase a reusable K-cup filter. This machine also gives the option of removing the drip tray, which is useful taller mug has to be used. To keep it running smoothly, it should be cleaned and descaled once every three to six months and. Also, replace the water filter after every 60 reservoir refills (or about 2 months). First of all, this coffee brewer uses soft pods, which are a convenient (and much cheaper!) alternative to the K-cup style of a pod. Additionally, the machine comes with a selection of Melitta coffee pods to get you started. You can make your coffee cup with almost no mess with this machine. In addition, the machine is sleek and looks stylish in the kitchen. This coffee-maker costs much less than a Keurig, and the coffee pods are cheaper as well. So, if you like the taste of automatic drip and the convenience of K-cups, this is a good compromise. To brew, you simply fill the tank, pop a soft pod into the basket, and press the “ON” button. Although soft pods are cheaper than K-cups, they’re still more expensive than using your own ground coffee. Fortunately, there are a number of options out there, both disposable and reusable, that allow you to make your own soft coffee pods. This also gives you the option of choosing how strong you like your coffee. Some people complain that one pod is not enough for a strong mug of coffee and that they often have to use 2 pods per cup. This machine also features an automatic shut-off. Note that the purchase doesn’t include a mug, but you should be able to fit any 12-ounce coffee mug into the machine. The HB 49981A is an innovative coffee machine that provides versatility, consistency, and quality in a simple, yet elegant design. It has also been ranked by the IDSA (Industrial Designers Society of America) for its unconventional design and optimized brewing. A metal filter allows you to use any coffee you wish, freeing you from the limitations and expense of pre-packaged coffee pods. Additionally, the scoop filter guarantees that you use the perfect amount of coffee each and every time. Cup size versatility. The Hamilton Beach 49981A is equipped with a fully adjustable cup stand, capable of holding both regular size mugs and tall travel mugs. Adjustable brewing strength. A single press of a button allows you to choose between regular drip-strength coffee or an extra bold brew for those extra difficult mornings. Perfect coffee portioning. A single cup scoop filter ensures that you get the perfect measure of coffee each and every time. Fast brewing. A freshly brewed 8 oz. cup of coffee is only 90 seconds away with the 49981A. Stainless steel construction. The stainless steel construction of the Hamilton Beach 49981A provides durability and style, along with a surface that is easy to clean and maintain. Auto shut off. An automatic shut off switch means you don’t have to worry about leaving your coffee pot on ever again. Uses real coffee. By using real coffee instead of pods, the 49981A opens up infinite possibilities, allowing you to choose any flavor from any company that roasts coffee. As well as providing perfectly brewed coffee, the Hamilton Beach 49981A eliminates complicated cleanup with its dishwasher-safe parts. When a simple wipe and rinse isn’t enough, simply put the removable filter, tray and scoop into the dishwasher for a thorough, sterile clean. Coupled with an automatic turn off switch, this machine is a great pick for anyone living in the fast lane. Pixie is an ideal pod coffee brewer for people on the go. Providing high quality you expect from Nespresso, the Pixie is a mix of quality, simplicity, and convenience. Brew single espresso shots or whole cups of coffee, in regular or tall size mugs, all with the convenience of the Nespresso capsule system. Cup size versatility. The foldable drip tray enables you to brew directly into regular size mugs or the taller size travel mugs. Convenient water reservoir. The Pixie’s 24 oz. water reservoir means that you can brew several cups of coffee before having to refill the water. Versatile brewing. A single press of a button will give you the perfect shot of espresso, or a perfectly brewed cup of coffee. Easy to read indicators. LED backlights to provide subtle, easy to read water level indicators. Used capsule storage. The Nespresso Pixie has a built-in bin for used capsules. Instead of having to empty every time, you can now brew up to 12 drinks before having to empty the bin. Quick heating. The Pixie’s 30 second pre-heat time means that a perfect coffee beverage is only ever a moment away. High-pressure system. Enjoy coffee-shop quality beverages with a high-pressure pump system that provides 19 bars of pressure. Automated safety features. An automatic shut off, coupled with a low water alert, means that you don’t have to worry about the safety of your machine. The quality and versatility of the Nespresso Pixie are matched only by its simplicity of design. All commands require the insertion of capsule and a simple press of a button, while automatic shut off and low water level warnings make this machine foolproof. A perfect choice for anyone who wants a no-nonsense machine that provides top quality beverages in no time. The Bunn MyCafe MCU is a mix of quality and total versatility in a simple, yet durable design. Choose any beverage from the full range of pre-packaged K-Cups, fresh ground coffee, hot chocolate or tea in any form. The simple design eases the cleanup of water reservoirs or other compartments. Simply plug in, add only what you need, and you are ready to go. Beverage versatility. The Bunn MyCafe MCU offers the full brewing range of K-Cups and fresh ground coffee, as well as loose tea, tea bags, and tea pods. Brewing versatility. The MyCafe allows you to choose from a 4 oz. espresso drink to a full 14 oz. cup of hot, delicious coffee or tea. Fast brewing. The quick heating time allows you to brew a cup of tea or coffee in under 60 seconds. Bold flavor option. The Pulse Brew option enables you to get a bolder, richer flavor by introducing the water in slower increments. Cup size versatility. Keep the drip tray in place for regular size mugs, or remove it to accommodate taller size travel mugs. Interchangeable brewing drawers. Easy to change drawers allow you to brew any kind of beverage without complicated commands or extra steps. Simplicity of design. The simple stainless steel design makes this model easy to clean and maintain. The lack of a water reservoir means cleanup is easy and quick. Quality guaranteed. A two-year manufacturer’s warranty promises that the Bunn MyCafe MCU is designed and constructed to provide quality beverages for many years to come. The Bunn MyCafe MCU is a perfect choice for those who only ever brew one beverage at a time. While other models may enable you to brew multiple beverages by using water reservoirs and used capsule bins, the MyCafe offers a more compact, hassle-free model perfect for those on the go. The Cuisinart SS-10 Single Cup Coffee Maker is the pinnacle model for quality and customization. Determine the size, strength, and temperature of your beverage, while choosing from over 200 varieties of K Cup beverage capsules. The K-Cup convenience makes beverages as easy as they are delicious. This coffee maker sits on the higher price side and is a masterpiece for those who stick to ‘Perfect Coffee Dose’. Large capacity water reservoir. An 80 oz. 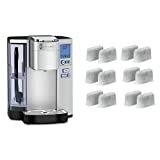 water reservoir allows you to brew multiple drinks at a time without having to refill the water. Versatile settings. Single button programming allows you to brew 5 different size beverages, including hot or iced. Easy to read display. The blue LCD clock display means that all your information is bright and easy to read. Internal water filter. An internal charcoal water filter ensures the purest water is used in making your beverage. BPA free plastics. All plastic components on the Cuisinart SS-10 are BPA free, meaning that there is no chance of any chemical interactions with your drinks. Automatic rinse. An automated rinse cycle means that no bitter aftertaste will result from coffee residue. Guaranteed quality. A three -year manufacturer’s warranty guarantees that your brewing system has the highest quality design and construction. Fully programmable. The Cuisinart SS-10 allows you to fully customize your beverages, offering full control over size, strength and even temperature. One touch controls. Single touch controls mean that customization is simple and quick. Whether you choose to entertain friends, or simply indulge yourself in a premium K-Cup beverage, the SS-10 is a perfect all around one cup brewing system. Combining quality and convenience, this model is perfect for anyone who wants to enjoy the coffee shop experience from the comfort of their own home. For those who like a balance of variety and convenience, Keurig offers the K250 2.0. It is already an established name under the one cup coffee machines and holds the most models. The K-Cup technology offers over 400 beverage flavors to choose from while providing simplicity and minimal cleanup. A sleek design and solid construction make this model ideal for any kitchen. Large capacity water reservoir. The Keurig K250’s 40 oz. water reservoir means that you can brew several beverages without having to worry about refilling your water. Versatility of size. With 9 different brewing sizes to choose from, you can customize your drinks as if you were at the coffee shop. Internal water filter. An easy to replace internal charcoal water filter will take away any funny tastes caused by water impurities. Touch display. The 2-inch touch display is as easy to use as it is to read. Easy cleanup. With both a removable water reservoir and drip tray, the Keurig K250 is a snap to clean. Brewing versatility. In addition to choosing your beverage size, you can also choose your beverage strength. Optional carafe. The Keurig K250 is also capable of brewing a 4-cup carafe of coffee. The carafe is not included. Beverage variety. The K250 uses Keurig’s K Cups, offering over 400 different beverage options, while still providing the clean and convenient K-Cup experience. The carafe brewing capability makes this single serve model even more versatile than most. Now you can entertain friends with the quality of Keurig in the form of single serve or multi-serve options. All the tastes of the coffee shop are only a touchscreen away! So, this is a recent addition to our list on 15 Sep 2017. It’s basically a portable and nonelectric coffee brewer that brews like a French Press without much mess. By less mess, we mean that it can even brew from K cups by Keurig and also the reusable adapters. It’s a useful thing if you have been using Keurig, you might already know about K cups very well and the best flavors to use. If you don’t have electricity for some reason or are on the go, this french press is going to be your great companion. What’s more, it brews an amazing cup of coffee. The pitcher included is microwave safe, so if you want to raise some temperature, it’s easy. The K cup holders or reusable k cup can be used in your Keurig machine also. For people using coffee makers like Keurig and Nespresso, don’t get your heart heavy as the one you are using is already used by many in the whole world and are happy with it. It’s just the mind that doesn’t sync sometimes and people tend to find other type of machines. Well, for people with this perspective about coffee grounds, we have a good news. There are brewers that use ground coffee as their raw material and are still a single serve. So, in this article, we will be telling about the best single cup coffee makers that don’t use coffee pods as their raw material. As its name implies, this coffee maker is perfect for anyone who likes to brew a single mug of coffee and take it with them on a commute. It is a single cup auto drip and comes with its own travel mug that fits almost in all car cup holders. This is an affordable one serve as well as one of the best unit for any busy commuter looking for a cheap option. This coffee brewer is an ideal choice if you like to make regular drip coffee and are the only coffee drinker in the house. It’s fast, space saver and so doesn’t take up much room on your counter. Moreover, it also makes a great cup of coffee. The Brew ‘n Go comes with a reusable mesh filter. If you prefer the taste or the easy clean-up of paper filters, you can use a #2 cone filter instead. Even with the reusable filter, cleaning up is pretty easy – you just tap out the grounds and give it a quick rinse. One potential drawback of this machine is that there is no timer, so you can’t set it to brew the night before. However, because it takes a maximum of 5 minutes to brew a mug, this should not be a big problem for most people. If you fill the water reservoir and put the ground coffee in the filter before bed, you will have coffee at the push of a button in the morning. 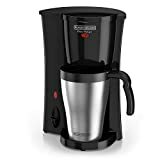 A marvelous coffee maker that is compatible with K cups as well as ground coffee with the provided jumbo refill cup. By jumbo, it means that one can brew stronger or a bigger cup of coffee as desired. The Touch Plus is equipped with RapidBrew technology that lets the machine heats up in less than 20 seconds to optimum temperature so that you don’t have to wait long for the coffee. The machine only heats the water that is required for preparation and not the whole tank saving time and energy both. You will never be regret after getting this machine home as it heats up fast, brews at optimum temperature, only heats the required water and also shuts off automatically. So all in all it’s an energy saving brewer that does it’s work fast and that too in a tasty way. This stylish little machine takes up almost no space on your counter and will brew you a 12-ounce cup of coffee in the included ceramic mug. It’s a bare-bones machine, but it delivers a great cup of coffee with very little fuss or mess. It has nothing in the way of extra bells and whistles, and one drawback is the lack of an automatic shut-off. You really have to get yourself into the habit of turning off as soon as you finish brewing the coffee. The fact that the power button is illuminated will serve as a good reminder and catch your attention if you forget to turn it off. The filter basket is of slightly unusual shape, which is not good news if you chose to use disposable paper filters. Soft pods might work, but otherwise, you’re better off just using the reusable filter that comes with the machine. It can be simply said best one cup machine in terms of cuteness. Ninja is actually a bold coffee brewer that gives a variety of coffee drinks at home that are usually found in cafes. It’s basically a skilled barista at home which is loved by coffee lovers who love to experiment and are not satisfied with just basic coffee. Previously, Ninja only provided a single type of coffee bar system but now the range has extended and now here is the Single Serve Bar Sytem that has integrated frother for simplicity. For those who have some spare time to make their coffee will find this Ninja Single Serve Bar brewer very useful. It will complete their hobby of experimenting with coffee flavors. Last on our list is the Flexbrew 49976 which is the latest model in the series. It looks futuristic and classy on any counter. The important aspect is that it is a 2-way brewer that lets you brew carafe on one side and a tumblr or cup on the other side. Both have separate water reservoirs. So, this one is for a family with varied minded people. Someone wakes up early, few late and so you need a brewer that caters to this. If someone wakes up early, he can brew from the single serve side whereas the rest of the family can brew in the carafe. For this, a little more area is required as the machine is kind of big. This is another great looking coffee maker that will add a touch of retro style to your kitchen without taking up a lot of room. It’s tall, it’s bold and for the looks, anyone is going to love it. It dispenses coffee directly into an insulated travel mug, which is included with your purchase. This little Coffee Brewer by Kitchen Aid makes hot, strong barista-style coffee at a press of a button. It comes in a variety of colors and includes a color-coordinated travel mug. The reusable gold-tone filter allows you to choose how strong you like the coffee and can brew any amount up to 18 ounces. If you don’t like mesh filters, you can substitute a #2 paper filter. Some customers have found that, while the included travel mug looks like a high-quality stainless steel vessel in pictures, it’s rather cheaply made. It is plastic on the inside, stainless steel on the outside, and it doesn’t insulate very well. You can easily pour the coffee into the mug after brewing if you don’t like the included one, or just brew directly into a different mug of the right height. This coffeemaker has an automatic shut-off for extra peace of mind. And if you encounter any problems, Kitchenaid will replace it within a year, hassle-free. Why we are not considering this at the top of our list is because of its brand awareness and utility design. But if you are open to retro styles that are somewhat distinct, there is nothing more beautiful than this unit. With 600 watts of power and generous 14-ounce water tank, this coffee maker brews a great cup of coffee. It is much cheaper than other branded brewers and just costs around $20. Obviously, water tank seems short in this but the brewer is very well worth the money. If you are looking to save some money in this category, this could be what you are looking for. It even outputs hot water to make oatmeal, tea or soup. The adjustable drip tray fits almost all size of mugs. There is no a clutter of controls on this machine so it’s very simple to operate. The filter is permanent so you won’t have to worry about paper filters. – Fresh Coffee every time: Though, being a single serve, anyone at home can prepare a fresh cup of coffee whereas, if you had a drip machine, you would be brewing around 4, 8 or 12 cups at one go. – Quick Preparation: Brewing a single cup is fast as compared to a full pot of coffee. – Ease of Use: Most of these machines are pod machines that are very easy to use operate. Even a small kid can prepare himself a great cup of coffee. – Save Money: Even when you are alone, you would be preparing yourself at least 4 cups of coffee with a drip brewer, so single cup simply saves you money by allowing just one preparation. – Variety of flavors: K cup and Nespresso coffee makers have a wide variety of flavors to choose from and since we are preparing one cup at a time, anyone at home can feed himself a different flavor. – Small Sized: The single cup machines are easy to store as they are a bit small sized as compared to other types. – Mild to Strong Cup for everyone: Each cup can be of different strength as preferred as most of these coffee makers have strength control. – Ideal for Home and Office: These coffee makers are ideal for most of the places as they are easy to use and maintain. Pod Brewer: The pod machines can be mostly found in hotels and instead of tea-bags, coffee-bags are used. These bags are called as pods and the machines, pod brewer. 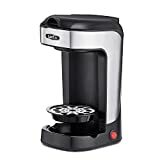 Single Serve with Filter: These are actually the traditional drip coffee makers that have a smaller area for coffee grounds and pull one cup of coffee at a time. Some have control over the cup size. Hybrid: As the name says, hybrids are with added functionality. Some allow using both coffee containers and grounds and some allow brewing single cup as well as multi cups. Capsule: The most popular form is the capsule coffee makers. Prepackaged disposable coffee containers are the raw material used here with a wide variety of flavors and strength. The major brands in this category are Keurig, Nespresso, and Tassimo. We have skipped a category, Grind and brew as single serve are here to ease our life by saving time where as grinding beans and then brewing takes up a lot of time which is not our intention. Because it doesn’t take that long to brew a single mug of coffee, most of these machines don’t include timers that allow you to wake up to already-brewed coffee. Some people have found a way to get around this by using a timer switch on the electrical outlet where the coffee maker is plugged in. Simply set the timer on the switch, and leave the coffee brewer ON. Just keep in mind that it only takes 2 to 5 minutes to brew a single mug of coffee, so a timer probably won’t be a big priority for most people. Here, we are going to show the best single-serve coffee makers that are already doing great for many consumers and come with a wide selection of features and right price tags. This is one most important factor to consider when buying anything. How much are you willing to spend simply filters you out from many unwanted products and also allow to look only the models which come in your budget? The single-serve machines can cost anywhere between $20 to $500 and the capsule coffee makers have an added cost of buying capsules repeatedly. K cups are the cheapest whereas Nespresso and Tassimo being somewhat expensive. Another important aspect is the dimensions. Decide where the coffee maker will be placed and compare it with the actual dimensions. Will you be able to refill the water reservoir easily? Are you able to clean the coffee maker without much hassle? Do you have the patience to wait for 5 minutes to brew a cup of coffee or you just need one within a minute? Drip brewers tend to take much time when compared to capsule types. Compare the noise levels of different coffee makers as it becomes irritating to hear a loud noise again and again in routine. The timer in a coffee maker gives an added advantage of waking up automatically with a fresh cup of coffee. These are not present in all models so think about this when making a purchase. Every person has their own preference and that applies to a coffee cup too. Few will demand strong coffee while few mild. Brew strength feature allows having control over it. For a great taste, filter water is must and if you have no budget constraints, consider buying a coffee maker with a built-in filter. But if you already have a source for filtered water, you can eliminate this option. If you are a new guy involved in all the tech stuff, it will be easy to get a hold on almost any machine. But if you are a simple guy who gets frustrated with more controls, look for a coffee maker that gives coffee with just one or two press of buttons. With all the above major factors, we expect you will be able to buy a perfect companion for your coffee love. While we have tried to compile the list with top rated single serve machines under fair pricing and best ratings, there might be some which we might have missed. If you have any in suggestion, feel free to mention it through comments.